Venue: Betty Oliphant Theatre - 404 Jarvis St.
Grammy-nominated sitar exponent Gaurav Mazumdar joins Vineet Vyas and vocal/dance artist Bageshree Vaze for an exciting evening at Lula Lounge, in Toronto on November 1, 2009, 7:00 p.m. onwards. 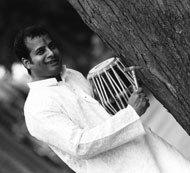 Tuesday, May 5, 2009 - 8 p.m.
Sunday, May 4, 2008 at 5:30 p.m.
An intimate evening of North Indian classical music and dance with Sarod by Steve Oda, Tabla by Vineet Vyas and Kathak dance by Bageshree Vaze. This musical event reminiscent of India's royal court (darbar) era features Canadian artists who have studied with some of India's legendary musical masters, such as Ustad Ali Akbar Khan, Pandit Kishan Maharaj and Pandit Birju Maharaj. Toronto's own Steve Oda (now based in San Rafael, CA) returns to his hometown to take the stage with husband-wife duo Vyas and Vaze for this unique event.